Last week the India-Africa Forum Summit took place in New Delhi, having been postponed from December 2014 due to the Ebola epidemic. Miko Brown assesses how the third summit contrasted with previous meetings, and what it reveals about where the African continent fits in Modi’s pragmatic and multifaceted foreign policy. 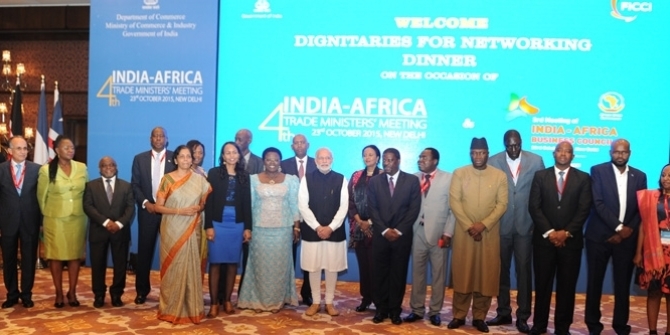 The third India-Africa Forum Summit (IAFS) was hosted in New Delhi from 26-29 October. This year’s event included representation from 54 African countries, with 41 heads of state or government, and marked the unveiling of Prime Minister Narendra Modi’s African foreign policy. The summit was originally scheduled for December 2014but was delayed due to the Ebola outbreak. As a result it had remained ambiguous as to where the African continent fitted within Modi’s foreign policy, which aspires to secure India’s regional hegemony and project a dominant India on the global stage. Even before the Summit commenced, it became apparent that the BJP government’s first IAFS would differ from the two previous summits hosted by the Congress-led government. Past summits extended invitations to 14 least developed countries (LDCs) that were selected by the African Union (AU). However, the October 2015 IAFS opened the invitation to 54 African countries (only Western Sahara was not invited). While past summits highlighted bilateral exchanges, the 2015 summit advocated for the India-Africa partnership to confront global challenges. Despite a larger guest list and more ambitious agenda, Modi’s desired engagements with the African continent follows in the footsteps of his predecessor, Manmohan Singh. The preference for economic diplomacy, or growing the Indian economy through renewed ties with committed global partners, prevails. This invokes a pragmatic and multifaceted foreign policy based on energy needs, security of the Indian Ocean region, Indian comparative advantages in technology and health, and bolstered soft power perceptions. Relations with Africa are premised on India as a nascent global power and a rising Africa that can fulfil India’s dire energy needs and serve as a market for Indian products. Furthermore, India’s African foreign policy is part of Modi’s geopolitical calculations to counter Chinese influence in the Indian Ocean Region. It is essential to explore what was actually accomplished at the summit. During the inaugural ceremony, Modi outlined the past successes of Indian education opportunities, ICT projects, and affordable pharmaceutical products that have improved African countries’ human capital and technological advancements. Additionally, the Prime Minister outlined a vision for the India-Africa partnership (which represents one-third of humanity) to play a vital role in global issues of reducing the global digital divide, respecting the environment, promoting the Doha Development Agenda at the upcoming WTO Nairobi Ministerial, reforming the UN Security Council, and sharing intelligence to combat terrorism. The summit produced the India-Africa Framework for Strategic Cooperation document that commits to reaching Africa’s Agenda 2063 and the UN’s Sustainable Development Goals. The soft power of Modi’s foreign policy derives from India’s offer of concessional lines of credit worth $10 billion over five years and grant assistance of $600 million. The latter will include 50,000 scholarships for Africans to study in India, a proposed expansion of the Pan-Africa E-Network, an India-Africa Development Fund and an India-Africa Health Fund. Since the first IAFS in 2008, India has extended $7.4 billion in concessional credit and $1.2 billion in grants. However, Modi’s India is still reluctant to project democratic norms over pragmatic partnerships as demonstrated by the participation in IAFS of President Abdel Fattah el-Sisi, who overthrew a democratically elected government in Egypt, and Sudan’s Omar al-Bashir, who is wanted by the International Criminal Court. The results of the third IAFS illustrate that Africa can fit within Modi’s economic diplomacy through bolstering the interactions with the Indian Ocean Region and promoting India’s comparative advantages while gaining access to natural resources. The importance of the “blue economy”, or the maritime activites, such as trade and security, that link India with other countries bordering the Indian Ocean explains Modi’s decision to travel to Seychelles and Mauritius. When Modi visited Mauritius in March, India offered the country $500 million in concessional lines of credit for infrastructure projects and signed five memoranda of understanding on cooperation and sustainable development of the ocean economy. A recent trip by India’s petroleum minister to Nigeria has opened the door to India sharing its knowledge and expertise in refining oil to help modernise Nigeria’s domestic oil refining industry. In exchange the India Oil Corporation will gain access to more Nigerian oil blocks, thus resulting in a “win-win scenario” of value-added capabilities for Nigeria and increased access to oil resources for an energy-dependent India. In an effort to expand ties across Africa, India has deepened its relations with Mozambique through ONGC Videsh Ltd investing $24 billion in the African countries’ natural gas. Additionally, the timing of IAFS is perhaps not a coincidence. India is currently overshadowed by China’s activities in Africa but Modi is aiming to take advantage of a weaker Chinese economy with a decreased appetite for natural resources and negative African perceptions of a “neo-colonial” China. While India can serve as an alternative to Chinese relations, African responses to continued Chinese engagement must be reassessed after the 6th Forum on China-Africa Cooperation (FOCAC), that will be co-hosted by South Africa in December 2015. It is unlikely that India can match Chinese engagement in dollars. Chinese bilateral trade with the African continent stood at over $200 billion in 2014. This figure dwarfs India’s trade linkages with Africa valued at $72 billion in 2014. Perhaps more crucial to Modi is continued Indian hegemony in the Indian Ocean Region. The threat of China intruding through its proposed military base in Djibouti sparks a need for India to bolster relations with African countries neighbouring the Indian Ocean. These strengthened ties serve to safeguard India’s dominance in this maritime zone. Finally, it is imperative look at the actors who participated in IAFS –Indian and African politicians, Indian public and private sector businesses, the AU, and African business delegates. Moreover, media coverage was skewed towards analysis in Indian media, while African media engagement (with the notable exceptions of South African think tanks and media outlets, see reports by SAIIA and ISS) was limited to government press releases and brief articles. Crucially missing from this summit were civil society voices, who will be needed to make this partnership realise its transformative agenda on both local and global platforms. During the closing ceremony Modi highlighted India and Africa’s “solidarity and unity can be a major force in the cause of a more inclusive, fair and democratic global order.” However, this “reinvigorated partnership” will be powerful in building a more equal and sustainable global order when Indian and African civil societies participate in shaping the modes of engagement. The agenda laid out by the third IAFS with the inclusion of an active civil society can confront the hubris of myopic “rising” narratives and recognise that India and Africa can learn from one another to overcome shared development challenges stemming from inequality, poverty, young populations and rapid urbanisation. Click here to read more South Asia @ LSE analysis of the 2015 IAFS. Miko Brown recently completed her Masters in Development Management at LSE. She has previously interned for Al Jazeera English in Washington D.C.
Read more of Miko’s South Asia @ LSE pieces here.